A semi-documentary film by Werner Herzog showing the ravaging effects of war. Anchor Bay USA R0 boxset + DVD release. A darkened planet somewhere in our solar system, its landscapes and people ravaged by the effects of a hideous war. 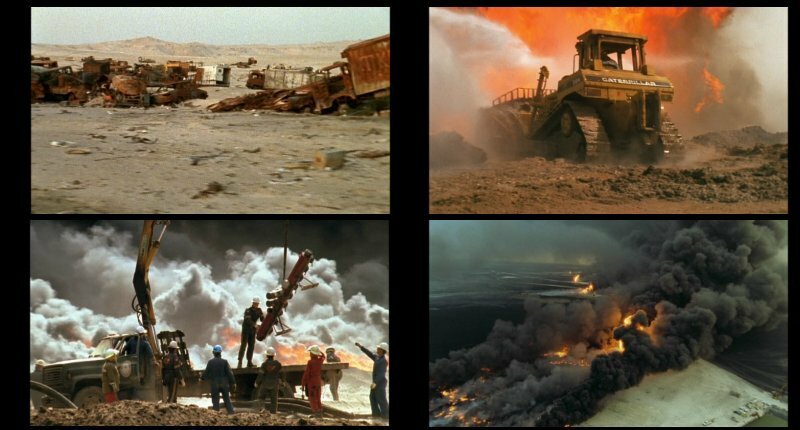 Lessons of Darkness is mostly comprised of footage shot shortly after the First Gulf War, showing the destruction of the landscapes and the blazing oil wells. 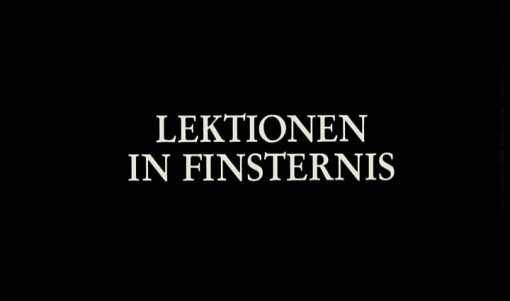 Although ostensibly a documentary, director Werner Herzog describes Lessons of Darkness as a science fiction film, he makes the deliberate choice not to identify the conflict or the countries involved, the opening narration even remaining vague as to which planet the footage was shot on. By avoiding the identification, it frees the film from any political statements - instead making a moral statement on the devistating effects of all wars, giving the film a timeless quality. The film includes two short interview clips with Kuwaiti women who had their families killed in front of them - these interviews seem out of place, although Herzog has explained that the film would have contained more, but he was expelled from Kuwait during filming. The camerawork is highly impressive with some very nice helicopter photography, and some close-up shots of the oil-well firefighters that get much more time to play out than in the short clips on the TV news. The audio is a mix of dark classical music and real sound that helps to emphasise the photography. In all, Lessons of Darkness is a powerful, and hellish visual experience, forming a curious trilogy with Herzog's desert mirages of Fata Morgana (1972) and the space footage of The Wild Blue Yonder (2005). It is certainly not a film for everyone, and you have to be in the right frame of mind to enjoy it - so it comes partially recommended, but if you enjoy films of this type it is highly recommended. Directed by anyone interesting? Werner Herzog - one of European cinema's best directors with a powerful artistic vision in all his films. A powerful audio/visual experience, not for everyone but recommended to those who enjoy these films. Good Soundtrack? A mix of classical music that suits the film well. Visuals Original Aspect Ratio - 1.77:1 Anamorphic widescreen. Colour. The print quality is very good with only light grain and very minor print damage. Colours come through very strongly. Audio German and English stereo - the only dialogue is the voice over narration from Herzog. Subtitles English - these only translate the on screen text and not the German dialogue. Availability Available in the Werner Herzog collection boxset, and in a 2-disc set with Fata Morgana. Cuts? None known. German language print. An amazing, hellish visual experience showing the ravages of war. Recommended. Find our reviews of other films directed by Werner Herzog. Review of the Werner Herzog Collection boxset. All text in this review written by Timothy Young - 21st August 2006.